Hillary’s email scandal was overhyped. We learned nothing new from the investigation or James Comey’s statement. Hillary Clinton in New York on March 9, 2015. The fuss over Hillary Clinton’s email has now proved to be one of the most overhyped news stories of this overhyped news season. Look at Tuesday’s statement by FBI Director James Comey. Ignore his self-righteous, scolding tone. Read the facts he’s uncovered, place them in context, and the conclusion is inescapable: As Gertrude Stein once said of Oakland, California, there’s no there there. About those first 30,000 emails, the ones Clinton turned over, the FBI handed them out to auditors at other agencies that might have an interest in the matter, and after months of review they “up-classified” 2,000 emails to confidential. In other words, when Clinton wrote or received those 2,000 emails, she and her correspondents would have had no reason to suspect they were jotting down classified facts. But the reviewers have declared them classified retroactively. Your taxpayer dollars at work. As anyone who’s ever had a security clearance will tell you, the labels secret and confidential mean next to nothing. When I worked on Capitol Hill in the late 1970s, the government gave me a secret clearance on my first day of work, pending the investigation into my worthiness to hold a top secret badge. As far as anyone knew, I might have been a Soviet spy, carting out confidential and secret documents every night and making copies for my handler. But they also knew the risk was low because there was nothing in those documents that the Soviets would have paid a dime for. The same is true of our various adversaries and stuff marked secret today. 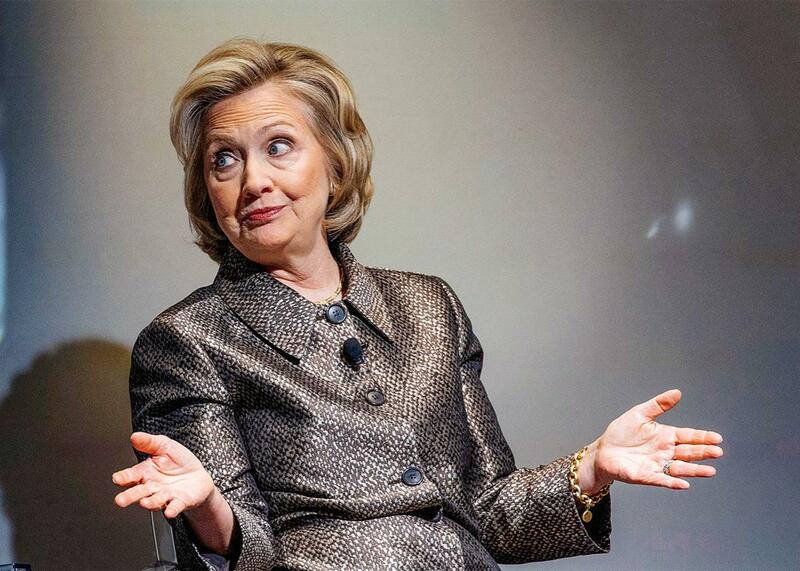 Top secret information is another matter, but the stuff that showed up in Clinton’s private email wasn’t so special. Seven of the eight email chains dealt with CIA drone strikes, which are classified top secret/special access program—unlike Defense Department drone strikes, which are unclassified. The difference is that CIA drones hit targets in countries, like Pakistan and Yemen, where we are not officially at war; they are part of covert operations. (Defense Department drone strikes are in places where we are officially at war.) But these operations are covert mainly to provide cover for the Pakistani and Yemeni governments, so they don’t have to admit they’re cooperating with America. Everyone in the world knows about these strikes; nongovernment organizations, such as New America, tabulate them; newspapers around the world—including the New York Times, where some of the same reporters are now writing so breathlessly about Clinton’s careless handling of classified information—cover these strikes routinely. In other words, even if Russian, Chinese, Iranian, or Syrian spies had hacked into Clinton’s email servers, and if they’d pored through 60,000 emails and come across these eight chains that held top secret material, they would not have learned anything the slightest bit new or worthy of their efforts. The FBI’s discoveries should be viewed in that context. Almost every news story on the FBI’s findings has reported that Comey contradicted Clinton’s long-held public rationale for keeping a private email server in the first place—that she did so as a matter of “convenience.” Yet, the stories point out, Comey said that Clinton had several servers and mobile devices in her time as secretary of state. It wasn’t convenient, after all! But they should have read Comey’s next sentence: “As new servers and equipment were employed, older servers were taken out of service, stored, and decommissioned.” In other words, by Comey’s own words, Clinton did not operate several servers or mobile devices simultaneously. Maybe “convenience” was a phony excuse, but it was not contradicted by Comey. The FBI director was certainly right in saying that Clinton and her colleagues were “extremely careless” in their handling of classified information. As rare and uninteresting as their discussions of such material were, they shouldn’t have done any of it on a private email server. There is evidence that the Russians tried to hack into her private account; there is no evidence that they succeeded nor would there necessarily be any evidence if they had. But Clinton’s actions didn’t break the law or damage national security. It has been widely reported that several senior officials have sometimes used their private computers and servers to conduct official business. Did their emails contain classified information, unwittingly or no? It’s hard to say: Nobody has investigated them. And yet, here is New York Times political reporter Patrick Healy, in a front-page news analysis, paraphrasing Comey’s rebuke of the current presumptive Democratic candidate for president: The FBI director, Healy wrote, “basically just called her out for having committed one of the most irresponsible moves in the modern history of the State Department.” I defy anyone to pore through the most scathing passages of Comey’s remarks and find anything that remotely resembles this description. The Hillary email scandal has been brewing for a long time. Like the Benghazi scandal, this one has fizzled out, and one can imagine the frustration of reporters and politicians who had been savoring a climax that just didn’t come through. The Times published three front-page stories and two more on the inside that said basically nothing that everyone didn’t already know: Yes, the Clintons are slippery, they have an unpleasant record of doing things their way, they have a problem when it comes to trustworthiness. Beyond that, there’s nothing here, folks, move along.